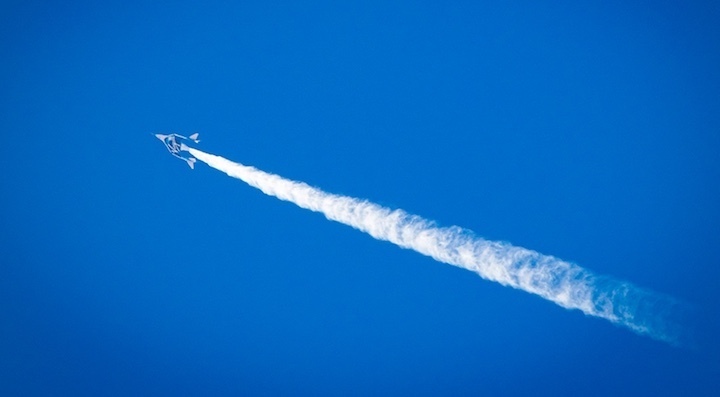 Whitesides did indicate that SpaceShipTwo, which made its last powered test flight July 26, would be flying again this year. “You’ll see at least one more flight before the end of the year,” he said. Besides testing the current SpaceShipTwo vehicle, named VSS Unity, the company has two more vehicles under construction. “We have a vision of building out a fleet of spaceships over time,” he said. “That will take some time to do, but we’re really looking forward to getting the next vehicle into service when it’s ready to start test flights.” The size of the fleet, he said, will depend on market demand. Whitesides said the company was also doing “preparatory engineering work” for a second WhiteKnightTwo airplane, which serves as the carrier aircraft for SpaceShipTwo. “We’re going to tweak it and improve it in a few ways,” he said. The company’s future plans increasingly appear not to include a $1 billion investment from the Public Investment Fund of Saudi Arabia. Virgin Group announced a non-binding memorandum of understanding with the fund nearly a year ago for the investment, which would go into Virgin Galactic as well as vehicle manufacturer The Spaceship Company and small launch vehicle company Virgin Orbit. However, Virgin had provided no updates on the status of that investment, including turning the non-binding memo into a binding agreement, since. A day later, Branson released a statement announcing that his companies were suspending ties with Saudi Arabia amid concerns about the fate of Jamal Khashoggi, a journalist who disappeared after entering the Saudi Arabian consulate in Istanbul Oct. 2 and is feared by some to have been killed. “What has reportedly happened in Turkey around the disappearance of journalist Jamal Khashoggi, if proved true, would clearly change the ability of any of us in the West to do business with the Saudi Government,” Branson said in the statement, adding that he had requested more information from the Saudi government about the status of Khashoggi. Until then, Branson said he was suspending ties with Saudi projects, such as being a director on two tourism projects. “Virgin will also suspend its discussions with the Public Investment Fund over the proposed investment in our space companies Virgin Galactic and Virgin Orbit,” he wrote.